Lowe hurt his shoulder after landing awkwardly during the draw with West Ham. 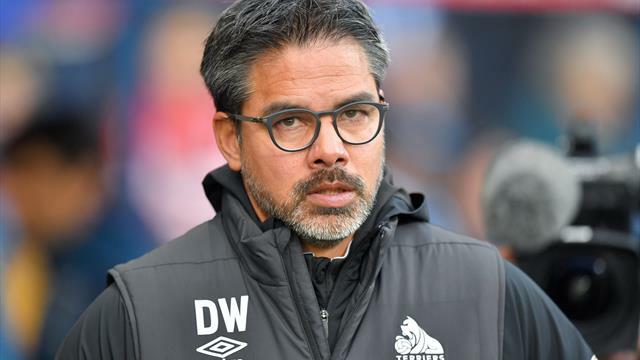 Huddersfield boss David Wagner is waiting to learn the full extent of defender Chris Lowe’s injury sustained in his side’s 1-1 home draw against West Ham. Lowe was carried off on a stretcher shortly before half-time after landing awkwardly on his shoulder during a challenge and will be sidelined for several weeks. The German left-back’s premature departure only added to Wagner’s frustration after his side had failed to hold on to a deserved half-time lead. Alex Pritchard’s first goal of the season was cancelled out by Felipe Anderson, who crashed home a 74th-minute rebound to rescue West Ham a point. “(Lowe) has a serious shoulder ligament injury,” Wagner said. “He’s in hospital at the minute and we’ll have to wait to see how serious it will be. Huddersfield had waited 659 minutes for a first home goal before Monday night’s 1-0 defeat of Fulham, but could have been 3-0 up in the first 15 minutes against the Hammers. Lukasz Fabianski brilliantly tipped Steve Mounie’s thumping header on to the crossbar and Philip Billing’s curling cross struck the inside of a post. “There’s a little bit of frustration today because in the first half we deserved to be in front. We were very good I think,” Wagner added. “Even if I’m a little disappointed I can see the positives and I’m happy as well about this performance, with the spirit and intensity the players have shown. “Four points out of these two games is OK. It’s decent, even if it could have been six. West Ham’s club record signing Anderson was pivotal to his side’s second-half fightback, but manager Manuel Pellegrini is expecting more from the Brazilian and the rest of his players. The Hammers have also taken four points from their last two games and are evidently coping better without key injured players such as Manuel Lanzini, Andy Carroll, Jack Wilshere, Carlos Sanchez and Winston Reid. “With all the players we are missing from our squad at the moment, it is difficult, there are six or seven players,” Pellegrini added. “But if you take out the first four games of the season, which were very bad, I think the team is improving with different names.